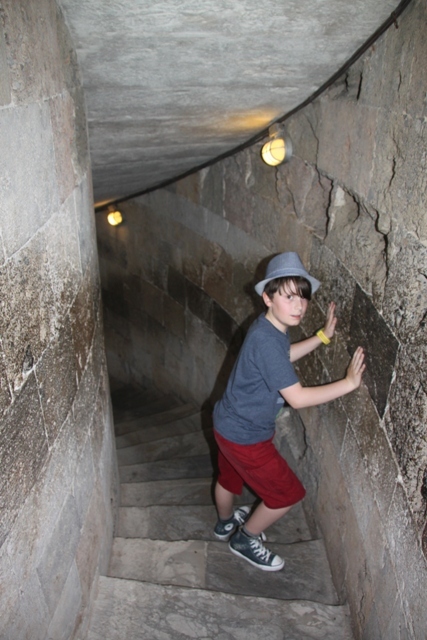 This is what Pisa was all about for Son – a trip to the Leaning Tower so he could pose for one of those cheesy “holding it up” pictures. Husband and I had visited years ago mid restoration project when they were working to sort out the tilt and prevent the whole thing toppling. We were only able to admire from afar that time, on this trip a climb to the top was a priority. So excitement levels were high all round but when strolling through the old town we suddenly and unexpectedly came upon this sight, well those levels went through the roof. We were all wowed by this first glimpse of the glistening and leaning white tower peeking out amongst the houses and buildings at the end of the street. The tower is beautiful, a tourist trap for sure but unmissable and we loved it. As we entered the square those awful photos were taken, Son posing happily but my attempts at capturing aforementioned pose got a definite thumbs down from him. This is the bell tower for the cathedral, they started to build it in 1173 but didn’t finish until the late 14th century. It is cylindrical, 54 metres tall with 8 storeys and there are 294 marble steps up a spiral staircase should you have a desire to get to the very top. 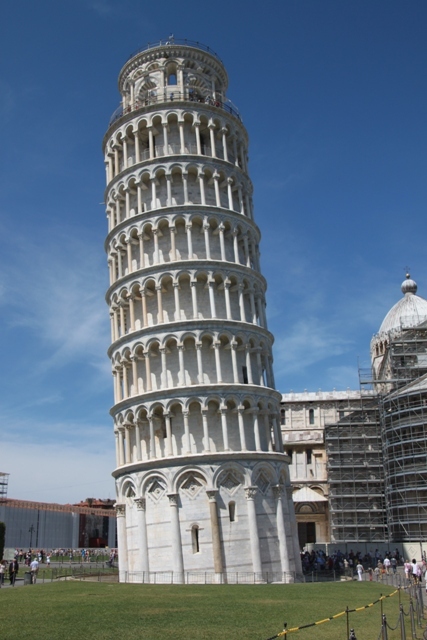 It started to lean soon after it was built – subsidence of the ground under the base – but the project to keep it from leaning more and tipping over completely was successful and now all and sundry can enter again and ascend to the highest level. You need to buy a reservation based ticket – you can get these on the day for a specific time but this could be 45 minutes to 2 hours after you buy it. Train timetables and tourist hoards made me feel concerned so I bought the ticket in advance on-line for the time we specifically wanted. As it happens there were still plenty of available slots, it would have been fine on the day. You are not allowed to take any bags up the tower, they have to be left in a locker in a different building. The queue to leave (and retrieve) the bags was huge, we stood in a sweltering line for 30 minutes each time, the worst part of the whole day. Inside the tower a lady gave us a short talk about the history and the restoration project, then it was time to ascend. The steps go round and round, you feel weirdly disoriented with the extreme tilt as you go up. Son hated this, felt very freaked out and Husband, as always with these things was entirely unsympathetic. I have to admit it is a strange and unnatural feeling going up but I quite liked it. The view at the top is gorgeous – definitely worth the pain of those steps. You climb up in groups of about 20 but can take your time and we didn’t feel at all rushed. 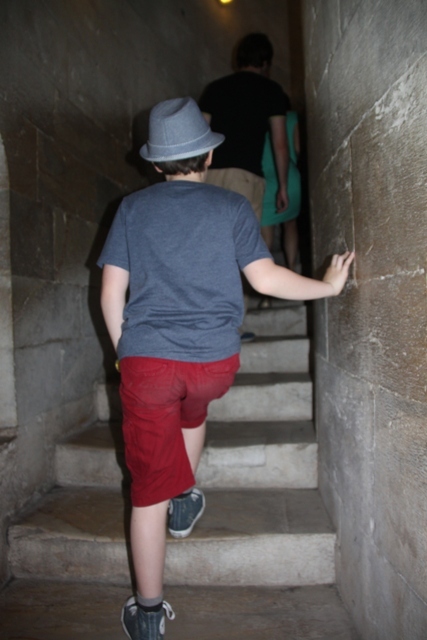 Children have to be minimum 8 years old to climb but I can’t imagine wanting to take kids younger than that up these steps. The worst part for me was the descent – hard on the knees, add to that the most slippery marble steps in the world with not a handrail in sight and you get one mildly terrifying experience. Freaked out going up, Son skipped down those steps like a mountain goat, octogenarian would probably be more appropriate for my descent. 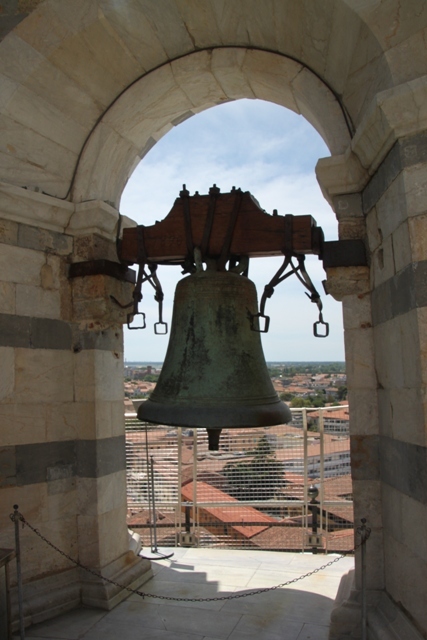 Still, it was definitely worth all the drama, I would highly recommend this and I think, for one reason or another, none of us will forget going up the Leaning Tower of Pisa in a hurry. I guess I had not realized you could get inside the tower. Great shots of the town. I liked the comment about no handrails. You should walk along the Great Wall of China – hand rails about two feet off the ground and slippery smooth stone steps worn into u-shapes by a gazillion tourists! I was entirely sold on the idea of climbing the tower some day because of your fabulous photos of the views. Then you mentioned the slippery steps and lack of handrail and I could already feel my vertigo kicking in. I think I would have to very much steel myself for this. 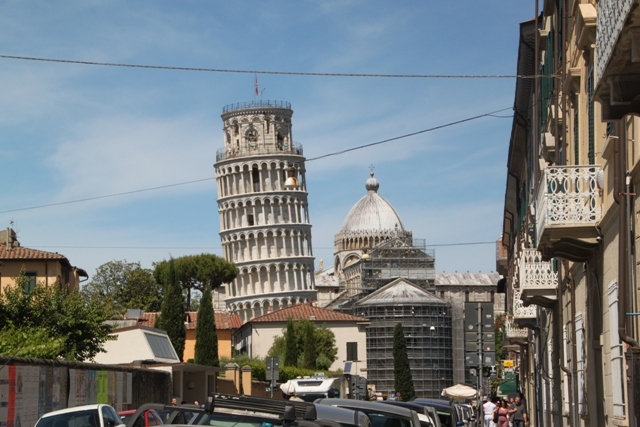 If we ever even get to Pisa, of course. Great review. Oh I really hope I didn’t put you off! It is well worth steeling yourself I have to say – hard to put into words but climbing at such a tilt is so strange and weird but a great experience. 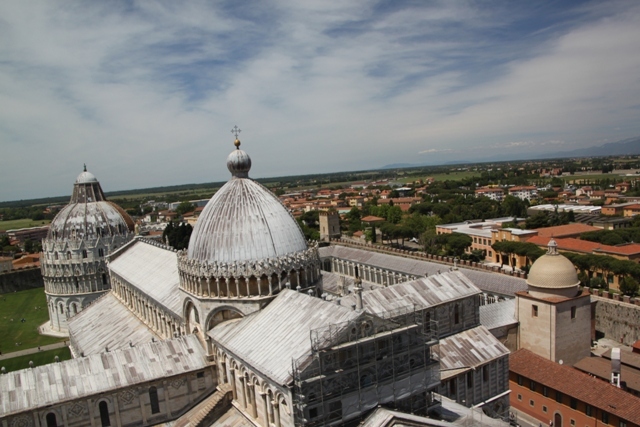 Also the views are wonderful – I am not so mad on heights but was totally fine here, definitely give it a go if you are in Pisa. Beautiful pictures, and thanks for the details (warnings!). I can’t wait, I am getting so excited for my first trip to Italy. Just wear shoes with grip Jennifer – everything would have been fine had I done that!! Hope you enjoy the build up to your trip. My son felt exactly the same way Rosemary so I totally get it! It is a very strange experience – surreal. It’s always helpful to know those seemingly little things that will actually end up taking a lot of time (like dropping off/picking up bags). The less-glamorous tips about traveling are usually the most useful 🙂 Great pictures, by the way. Thanks Amanda! The bag thing was a pain, maybe if we knew in advance we would have resigned ourselves to it rather than getting hot and grumbly…. hope it helps someone! Really want to go there one day. The one thing that does turn me down with all the world known sights is all the queuing… But being able to book a time slot for you does sound manageable, and worth doing! I hate queuing too – however the time slot thing really worked well for going up the tower, no waiting around at all really. Just the bag thing… now that was frustrating! I had no idea you could walk up inside it. That is interesting, and I’m sure the feeling of climbing a leaning tower is a tad scary. It was closed for quite a few years while they worked to sort out the tilt and stop the whole thing falling right over, but now you can climb to the top again. It is the most unusual feeling, really hard to put into words but fun nonetheless! I found the climb quite surreal.. My eyes didn’t really pick up the slight tilt but my brain did so I almost felt seasick as I advanced up the stairs. It was well worth it though! 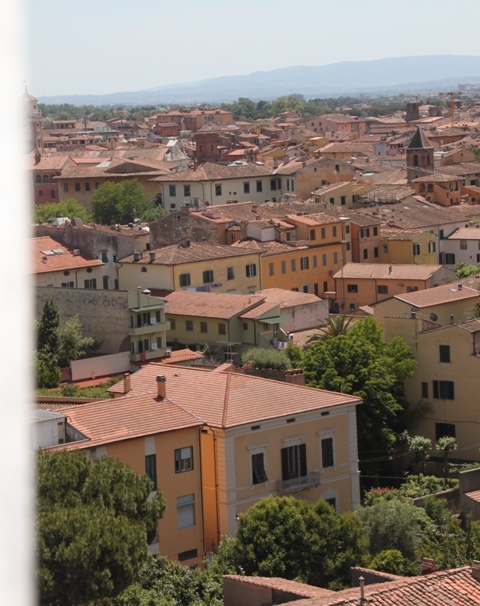 Have you climber the Duomo di Firenze? Now that climb almost killed me and it’s only one way so the stream of tourists coming up behind and the narrow path pushes you to continue. I was struggling to put the experience into words Leah but that is exactly what it was like – seasickness – I felt queasy in a weird way climbing too. We did climb the Duomo in Florence on a later part of this trip, not quite got round to sorting out the photos yet but will probably do a post on that when I get organised! You’re right though, that was definitely a killer, my legs were still trembling about an hour later. I don’t think the age would be a problem to be honest, they didn’t seem at all strict when we were there and nobody particularly checked. It was on the tickets etc. but I think with a 7 year old nearly 8 you would be fine. It’s more to discourage people taking much younger kids as with such narrow (and slippery) steps there is no way you could carry them or help too much going up and down! 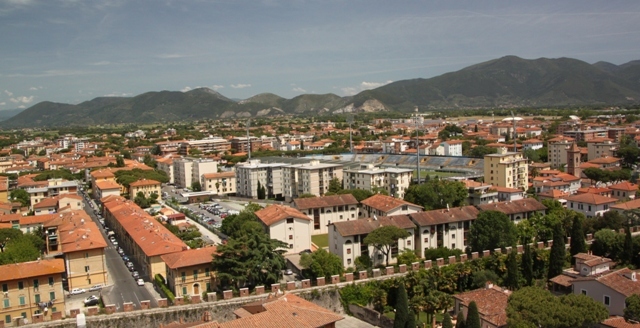 Looking forward to reading all about your time in Italy – never been to Lucca but the whole area is beautiful. We’ve been to Italy several times without seeing this (can’t remember why now – we had reasons, they made sense, I think). It sounds like a good one to save up for the kids, though. Gotta love the cheesy shot potential and yes – some tourist traps have to be visited regardless! It’s a great place to visit despite the mass crowds, although it wasn’t that bad really in the square. Cheesy shots were taken and I definitely enjoyed it all much more than I thought I would. Your kids would really love it, although your son (like mine) might struggle to believe all that stuff about a leaning tower being stable and perfectly safe to climb up!